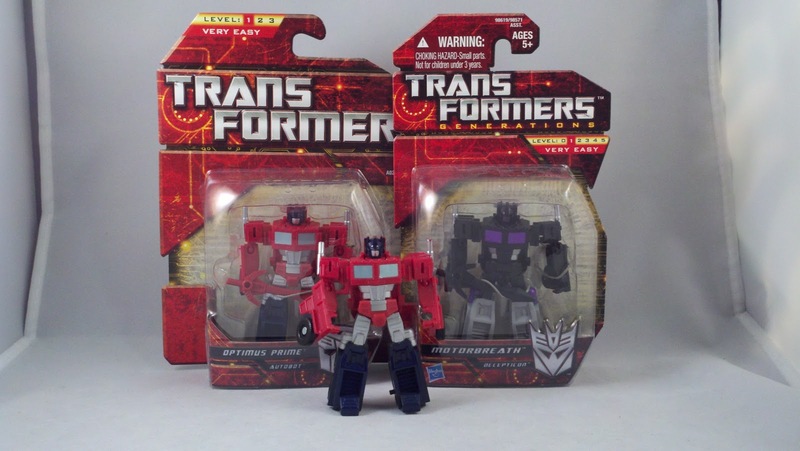 It's time to take a look at the second half of Hasbro's on-line exclusive set, the Transformers Generations 'Ultimate' Gift Set. 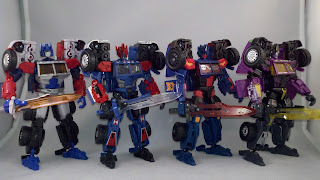 On Wednesday we looked at the first two figures, the Deluxe G2 patterned Jazz and the Legends scale Thundercracker. 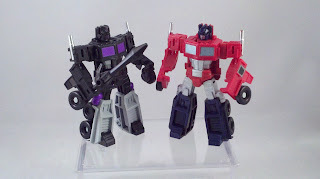 Both good figures, but to me, the real Energon goodies in this set are the Optimus molds. 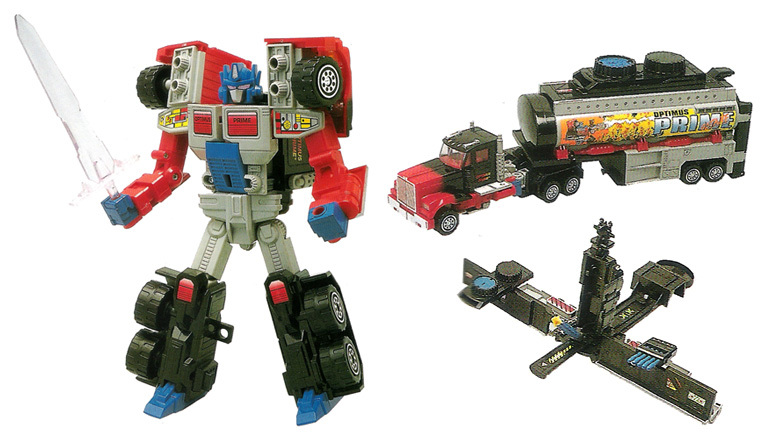 Take a look at the G2 inspired Optimus and his smaller enemy counterpart, Motorbreath, after the jump! To reiterate a little bit of info for those that may not have checked out the review on the first half of this set, this set comes well packed in a nicely put together window display box. Solid card with a card tray insert that the figures plastic tray sits in. We get some re-hashed box art, the typical brief explanation behind the box itself, and some Tech-Specs for each character. We get 2 deluxe scale figures and 2 Legends scale figures for a fairly decent price. 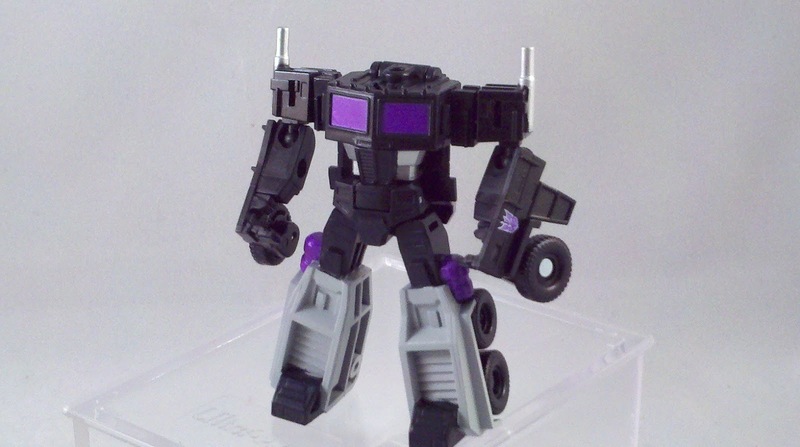 The first figure we're going to look at today is Motorbreath. 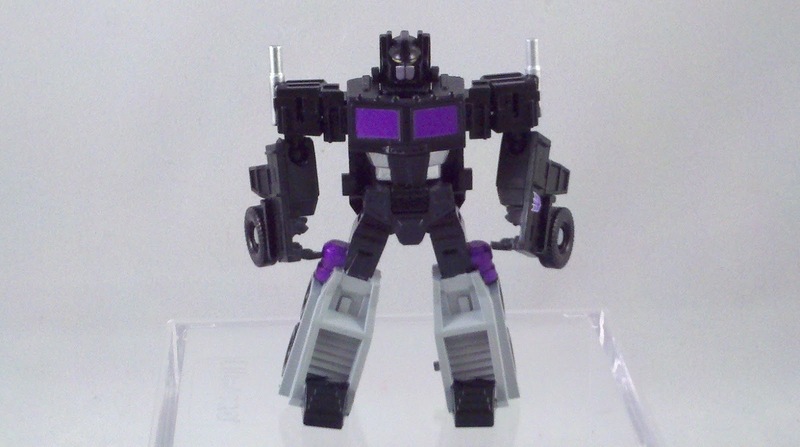 Ok... so the character is actually MotorMASTER but for copyright purposes, the name has been altered. 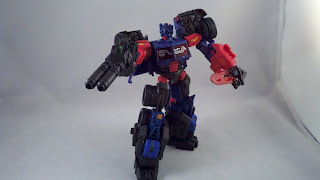 Motorbreath is a repaint of the Reveal the Shield Legends scale Optimus Prime. 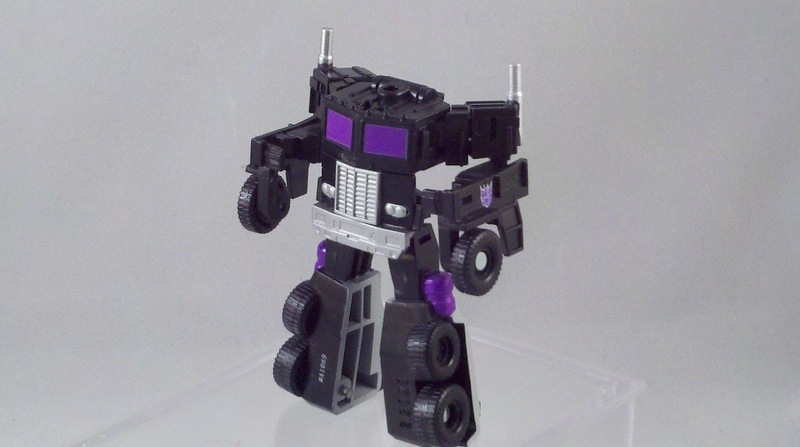 This is the exact same Motorbreath that was released in Japan, but Hasbro brought it to us as a Toys R Us exclusive. 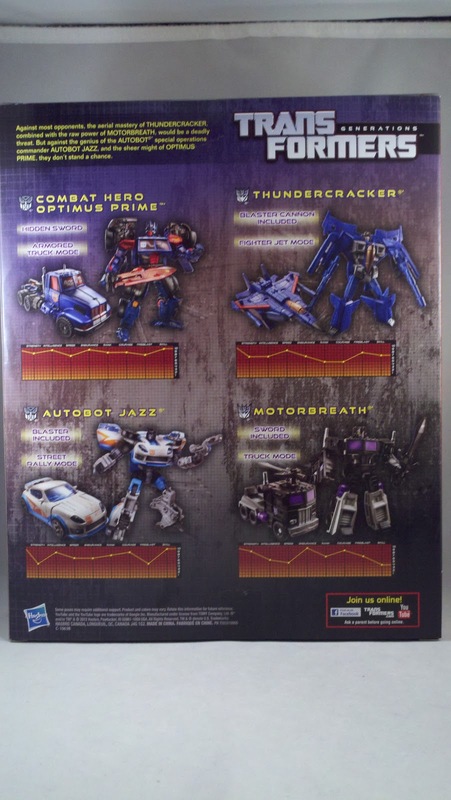 Hasbro then repacked Motorbreath in this 'Ultimate' Gift Set. To go along with my new Motorbreath, I have the Japanese release of Motorbreath on card along with the Optimus Prime versions of the mold from both Hasbro's Reveal the Shield line (loose), and the Japanese EZ collection release that has a G2 Autobot shield and sword accessory still carded. 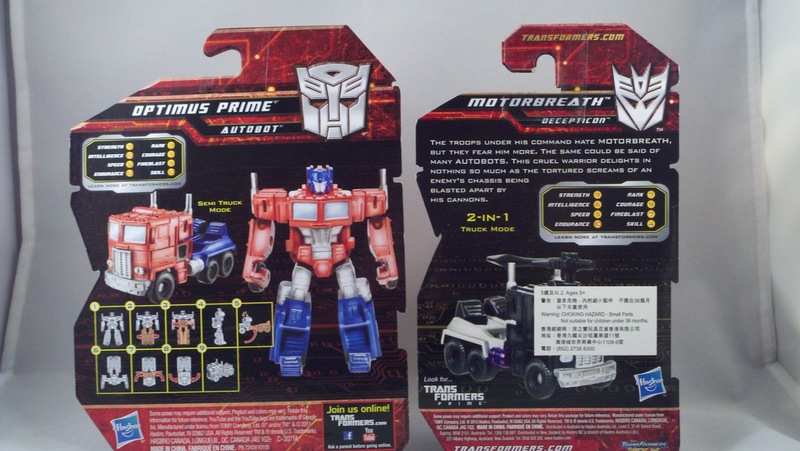 The 'Ultimate' Gift Set Motorbreath does not come with any instructions. But it's a Legends scale figure... it's not too difficult to figure out. 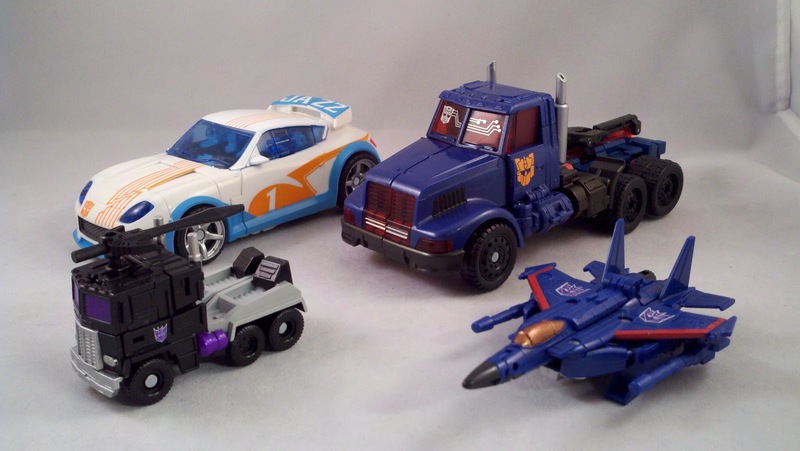 Like Thundercracker though, these new Legends scale figs have been getting pretty complex for their size while still retaining a good look. 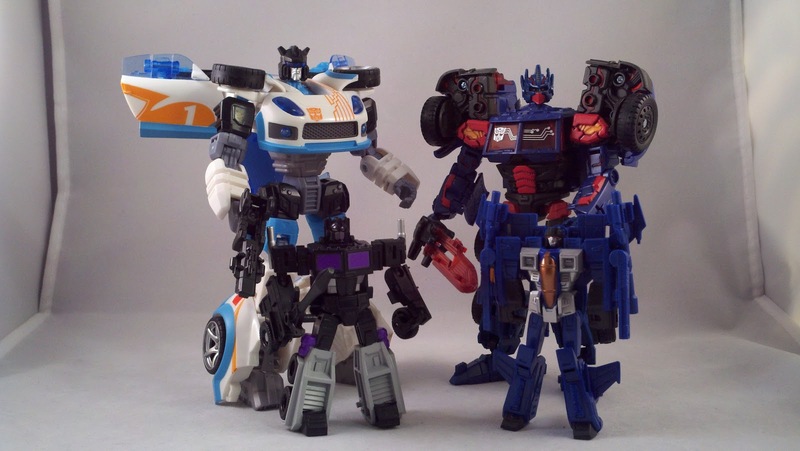 Motorbreath isn't as complex as Thundercracker though. I really like this little mold. It transforms easily and still gives a good look for the character. There is little to no kibble in either mode. I'm hoping that one day we do get an honest to goodness new version of Motormaster... and it looks as though FansProject will be doing that soon. Now for the icing on the cake for this set... well at least in my opinion. 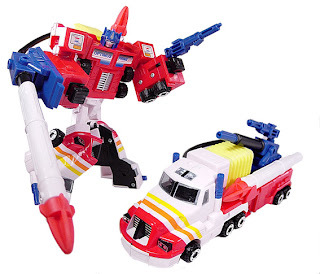 I'm a huge Optimus fan so any Optimus toy is a good Optimus toy. 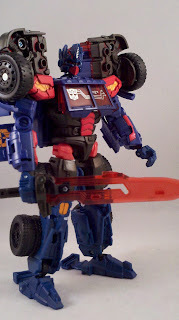 The second Deluxe figure that we received in this set is 'Combat Hero Optimus Prime'. 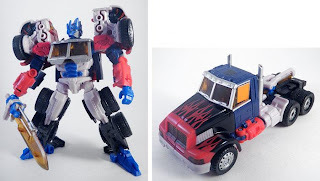 OPtimus comes as an homage mold to a G2 figure in the homage color scheme of a G2 figure we NEVER got in the first place! 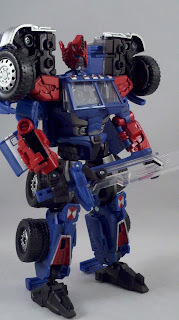 The mold is the Transformers Reveal the Shield Optimus Prime from 2010. 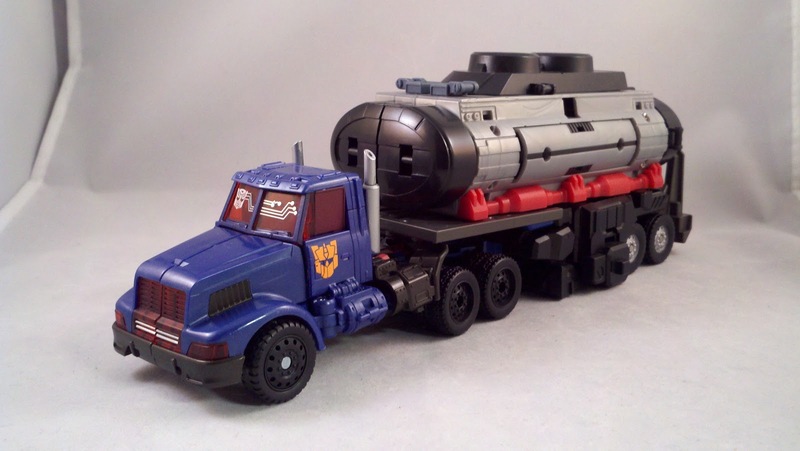 The mold is an homage to the G2 "Laser" Optimus Prime; which was a new concept for Optimus having the longer cab and more of a tanker for a trailer. 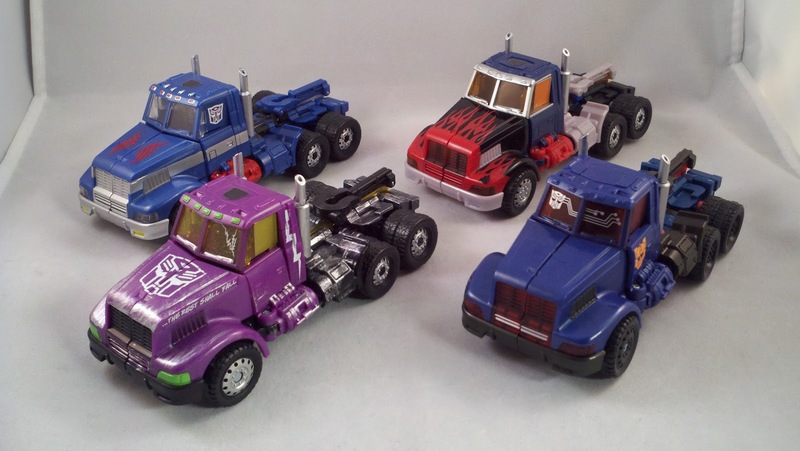 The RTS mold of Optimus transforms in almost the same way with some newer engineering for the head and chest. 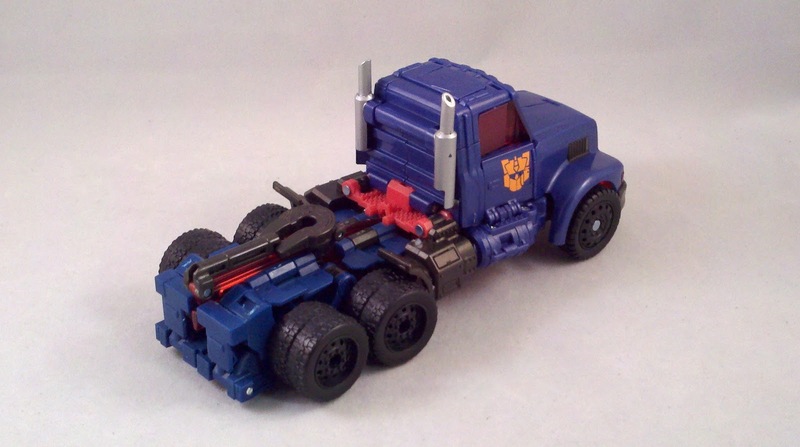 The shoulders still form from the chest and the legs still form from the back end of the truck. 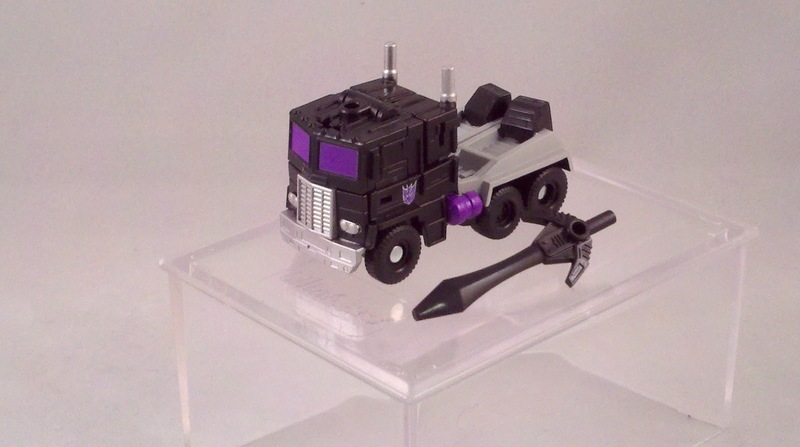 Instead of the sword being fitted beneath the back, the newer mold incorporates the sword into the Alt-mode. The hilt of the sword is the horseshoe that pulls a trailer; it's pretty ingenious. You'll notice that the mold incorporates 2 different generations of Autobot shields. Along the front window is a G1 shield. 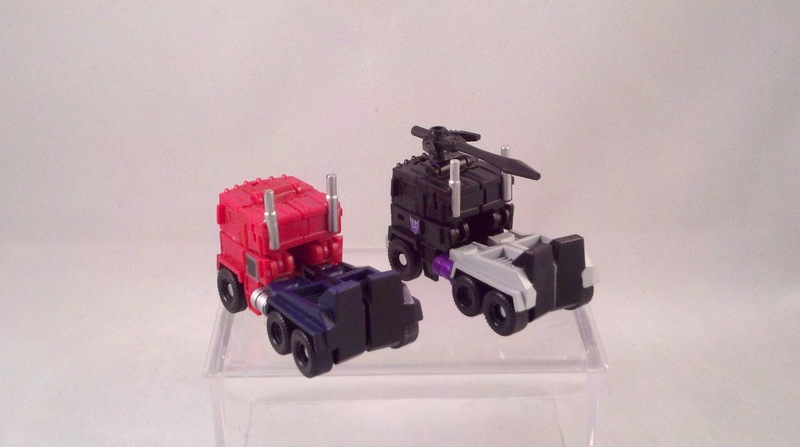 Tampo'd on both doors is a G2 shield. 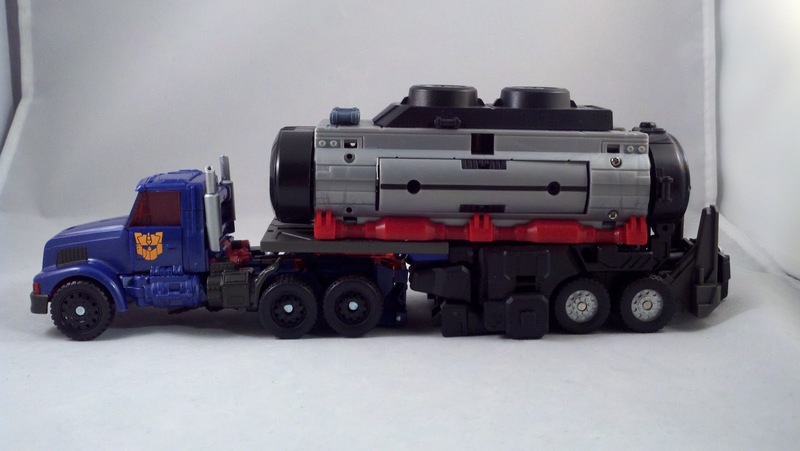 In Bot-mode, the top of the cab will be formed into Optimus' pecs which places the G1 logo firmly on Optimus' chest. 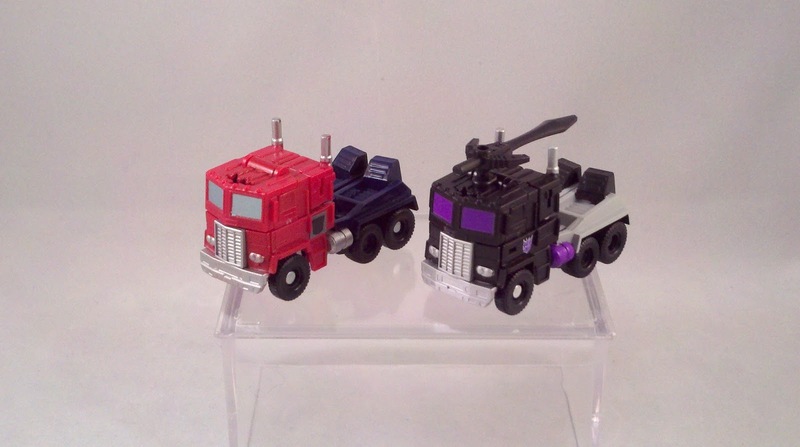 The G2 logos merely dangle from the doors that are attached to Optimus' forearms. The coloring from this mold is yet ANOTHER homage to a past figure... that we never even got. 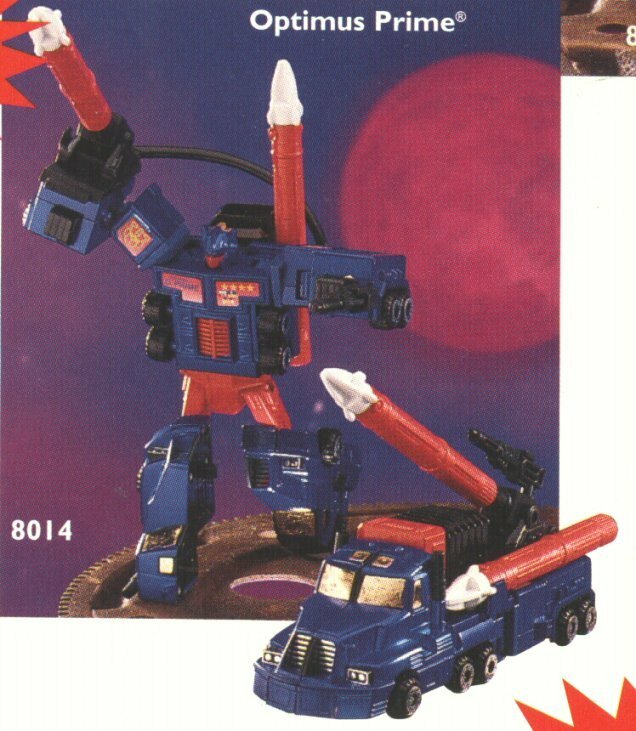 During the G2 days, circa 1994, we received a mold that was dubbed 'Hero Optimus Prime'. 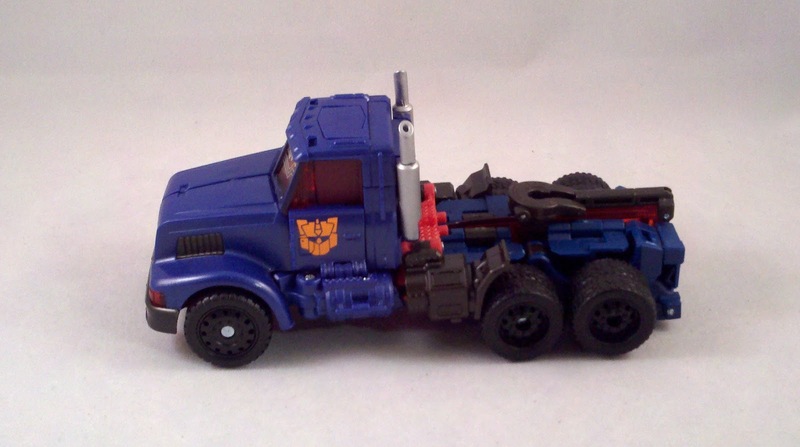 It was a very simplistic mold that combined Optimus and a trailer into one figure. 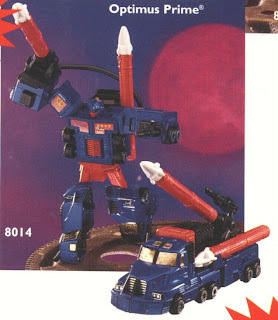 The gimmick for the figure was a cannon that fired Nerf-like missiles when an air bladder was hammered down on. I still, to this day, do not have this figure... which makes me sad. A second version of this figure was to be released. Dubbed "Combat Hero Optimus Prime", his color scheme was reminiscent but not an homage to, Diaclone's Powered Convoy. Sadly, this figure never made it to us at all. As you can see, our new Combat Hero Optimus pays a nice homage to our never received Combat Hero Optimus. Plenty of red and dark blue, even the face-plate received a coat of red. If you never picked up the Reveal the Shield version of this mold, I think you're missing out. This figure is well articulated and is capable of holding his sword in both hands. 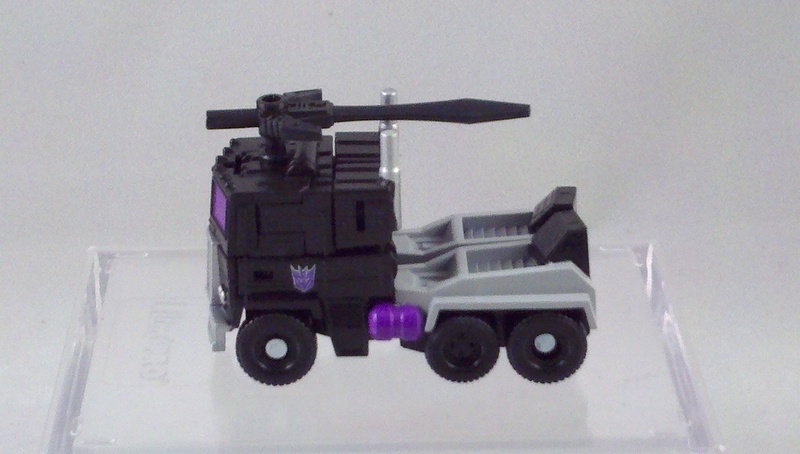 The fuel tanks from the Alt-mode snap together at his back and provide a good place to stow his sword. This mold has been used 4 other times... 3 of which I have... the 4th is the United Laser Prime which was colored slightly differently from... blue instead of orange windows, black instead of a blue body, blue instead of an orange/yellow sword, and a few different paint apps. I wasn't going to shell out for shipping on this one... but the more I think about it and see it, the more I want yet another version of Optimus. 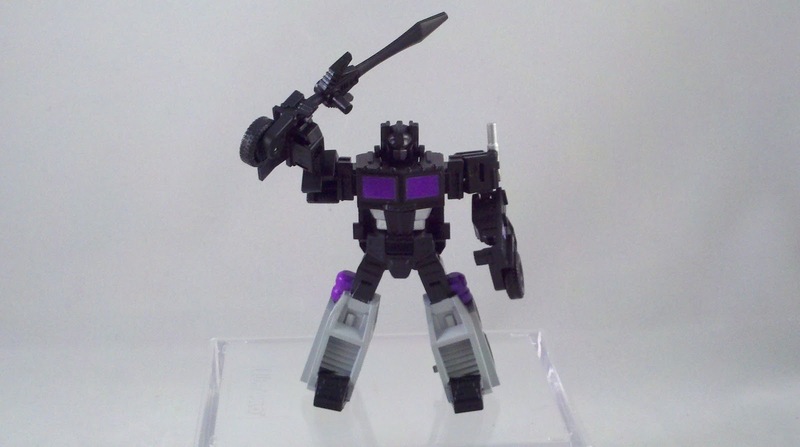 The other 2 versions of this mold were received recently as Exclusives in this year's Botcon "Invasion" story line. 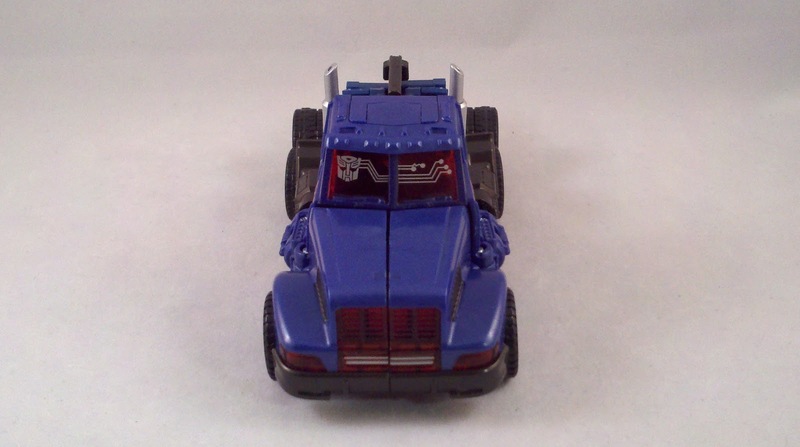 The first mold was used in the 5 figure box set as Shattered Glass Ultra Magnus. 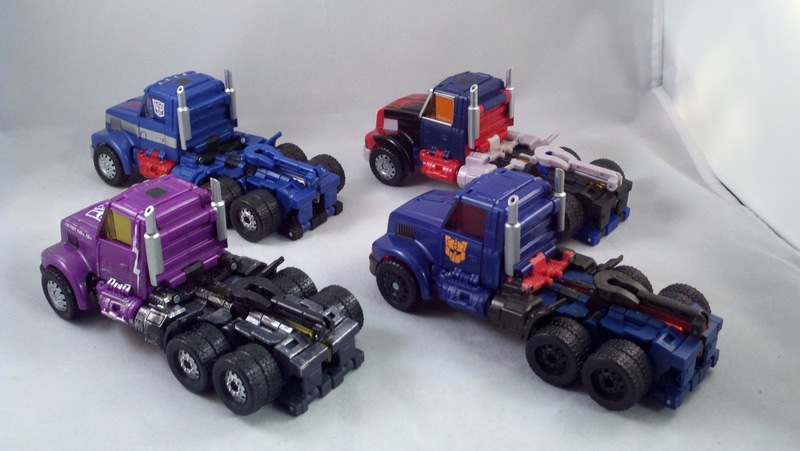 SG Ultra Magnus came as a definite homage to his color schems as Diaclone's Powered Convoy. 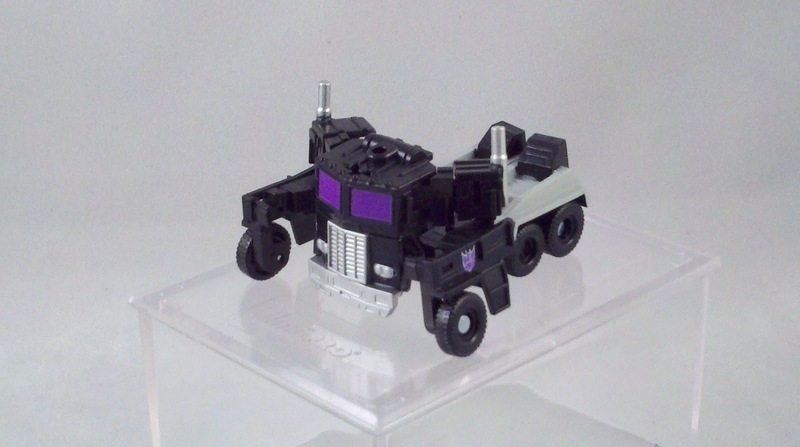 This was one of the set exclusives that was given a variant head mold. 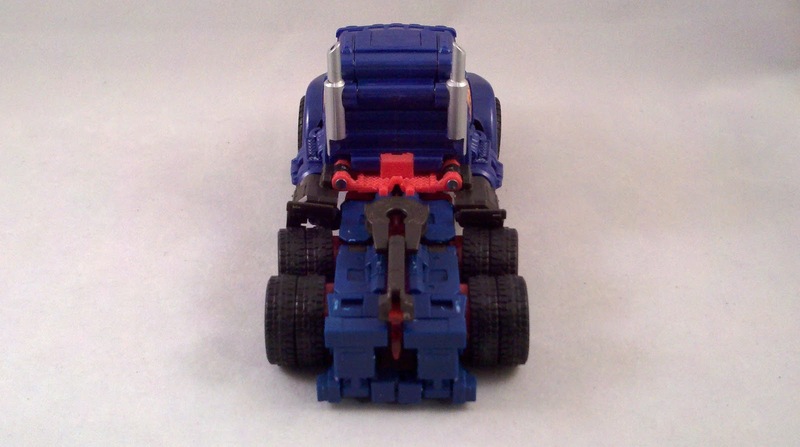 According to his Bio, Optimus was upset with Magnus and during a fight between the two, Optimus ripped off Magnus' face leaving him with a skull-like visage. Magnus' sword is the fabled Terminus Blade, capable of slicing through dimensions. 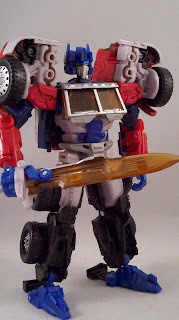 SG Optimus Prime was our fourth use of this mold. 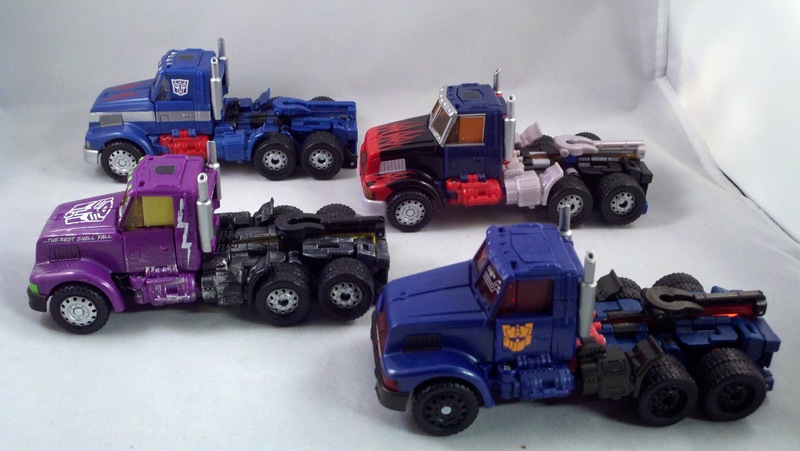 From the same set as Ultra Magnus, Optimus came bagged in a 2pk. 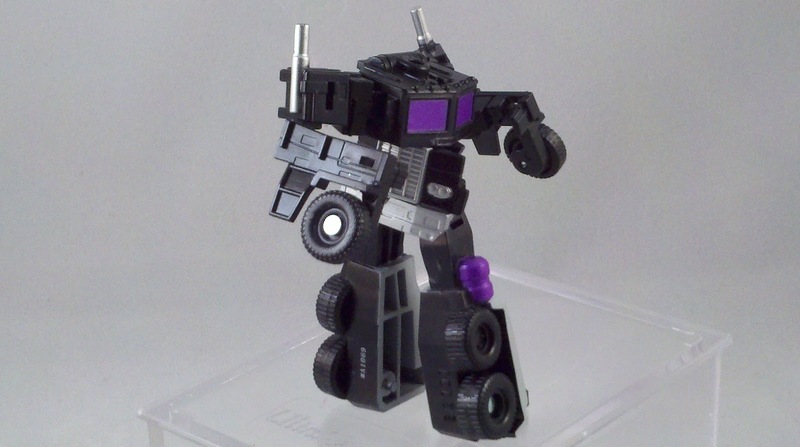 with the Special Ops Jazz repaint, kick-Over. Optimus came colored in his SG purple and blue scheme with a yellow bladed sword. 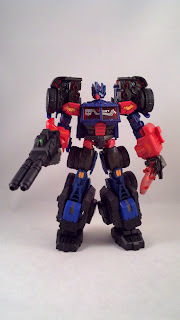 This updated SG Optimus had been left for dead by his followers and after dragging himself to safety, updated his systems and body. Fashioning a G-Metal (I've no idea what G-Metal is) he took his revenge on those that left him behind. Coming soon we will receive the 5th use of this mold in the form of the OTFCC (Official Transformers Collector's Club) Subscription line. The mold will be used to make the Timelines story arc's evil Optimus Prime clone, Scourge. This figure is one of the reasons I signed up for the Sub. 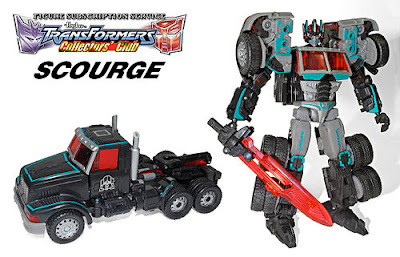 Scourge will be in his normal black with teal detailing color scheme and wielding his red sword. 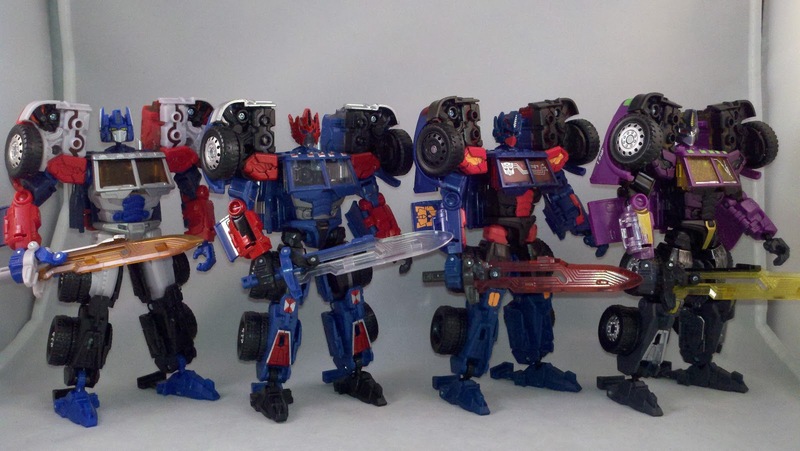 Notice that the faction shields are upside-down G2 Autobot shields? 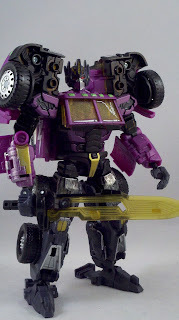 An homage to Scourge's appearance in "Transformer: RiD". I do own 2 of the original Reveal the Shield mold. The first sits as is from when I freed him from his plastic prison. The second got a few modifications done to him when I picked up the Maketoys Battle Tanker... which you can see reviewed HERE. 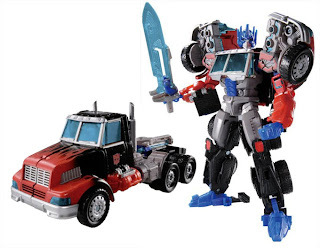 Optimus received a new head and cod-piece from the set; the head is just aesthetic, the cod-piece allows a bigger piece to be snapped into place when you combine him with the Battle Tanker. I really like the replacement head. Based on a request from a few friends in some forums, I took the armor parts from the Battle Tanker and bulked up Combat Hero Optimus... the blue and red from the Battle Tanker mesh well with Combat Hero Optimus' color scheme. Of course I'm a sucker for just about anything Optimus. Despite that, I do really like this mold. It pulls from a toy that I really enjoyed and thought was cool when I was younger. The updated articulation and transformation just knock it out of the park. The head mold is a bit... anime(?)... as it's very stylized and pointy. But I'm good with that. As for the my overall thoughts on the 'Ultimate' Gift Set itself, I'm still not to keen on the character choices. And I certainly think a more even distribution of factions to scales would have made this a much better set. And of course, I couldn't leave you without showing them all together. 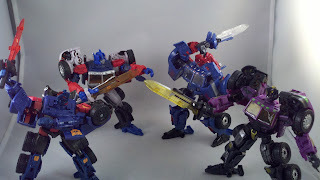 Pics, review, and overuse of the word 'homage' by' Scion of Primus. None of what you show is a "Japanese" or "EZ" version. 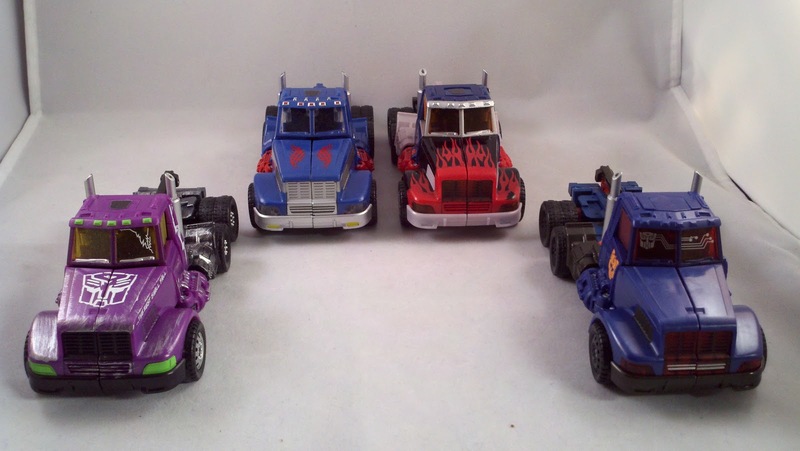 Motorbreath, along with the other Generations GDO toys, was originally released in Hasbro's Asian markets, which include Hong Kong, mainland China, Singapore etc., but exclude Japan, which is TakaraTomy's market. "EZ Collection" packaging also looks quite different. The Optimus Prime deco with sword accessory in your photo certainly has a G1 symbol, not a G2 one, and is simply a running change version of the "Market Six" or Dollar Store" United States release. 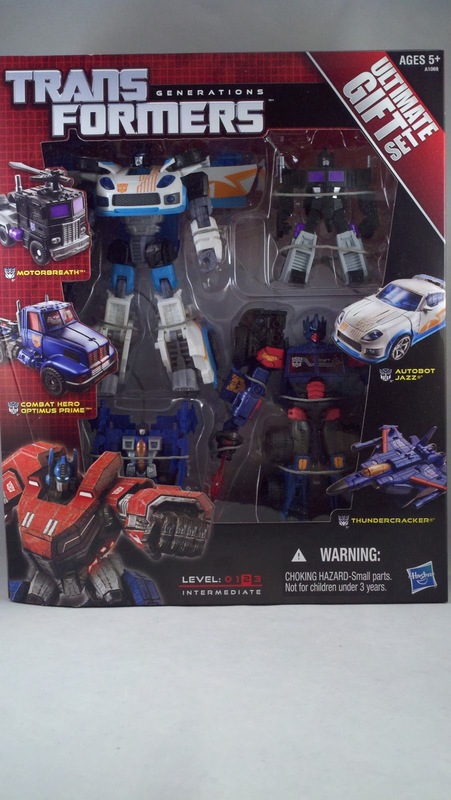 That one came in a wave with Starscream, Megatron (Universe 2.0 tank, unchanged deco) and Bumblebee (Universe 2.0 sculpt, in a deco based on the one from the Toys'R'Us exclusive DOTM Cyberverse Starscream/Bumblebee four-pack, with some minor deco changes and one small tooling change). Optimus Prime and Starscream inexplicably use the decos of their EZ Collection counterparts, and by the time the GDO retools for Motorbreath and Thundercracker went into production, the "Dollar Store" assortment saw running changes to Optimus Prime and Starscream to sport the retooled Cyberverse-style hands and the accessories of Motorbreath and Thundercracker, respectively. But none of these toys in these packaging styles have been available in Japan except for import stores.